To the North Norfolk Circuit Website. The North Norfolk Circuit stretches along the beautiful North Norfolk coast from Weybourne to Mundesley; out as far as Hickling on the Broads, and inland, through beautiful countryside as far as Reepham. Prayer is important to us in every situation, in celebration and in sorrow. 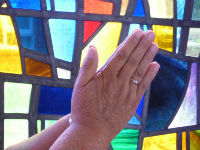 If you would like to share a prayer with us please click on the hands below. 1. Inclusive worship and Bible study of contemporary and traditional styles. 2. Being alongside the disadvantaged and marginalised. 3. Being seen to live what we believe - living as the people of Christ.